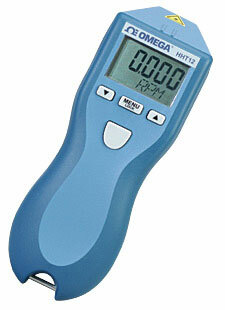 The HHT12 is a digital, battery-powered portable optical tachometer. The unique design allows you safely view both the target and the display at the same time, while providing a no-slip rubber housing. HHT12 is the value leader of the world-class Pocket Tachometer Series from OMEGA. Features include a 5 digit/alpha-numeric LCD display and a range from 5 to 99,999 RPM. Accuracy is 0.01% of reading or ±1 Digit. The HHT12 also includes maximum, minimum and last memory. Operating range is from 50 to 915 mm. Nota: Comes complete with two 150 x 12 mm strips of reflective tape, two “AA” batteries and complete operator manual.